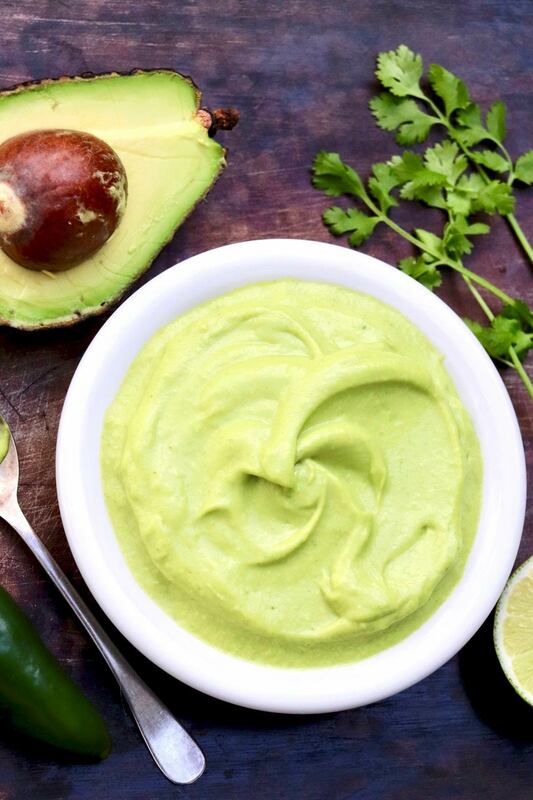 The flavor of this lusciously Creamy Avocado Lime Sauce is matched only by its versatility…so much so that it might just become your new favorite condiment! Move over guacamole! Ok, I’m joking. Good guac is hard to knock. 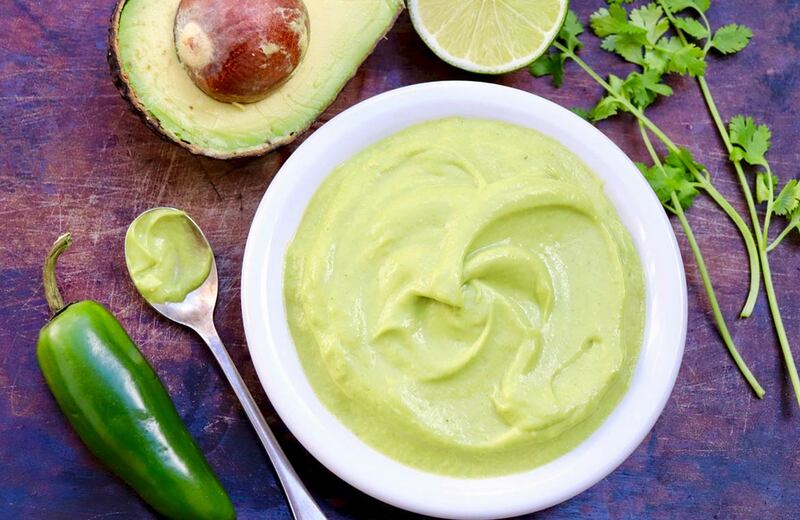 This versatile, super creamy avocado lime sauce, however, has the power to transform even the simplest of meals. Plus it’s dairy-free and vegan and will maintain its beautiful green color for days. Years ago, I shared a recipe for “Everything Sauce,” aptly named for its knack to perk up just about anything. 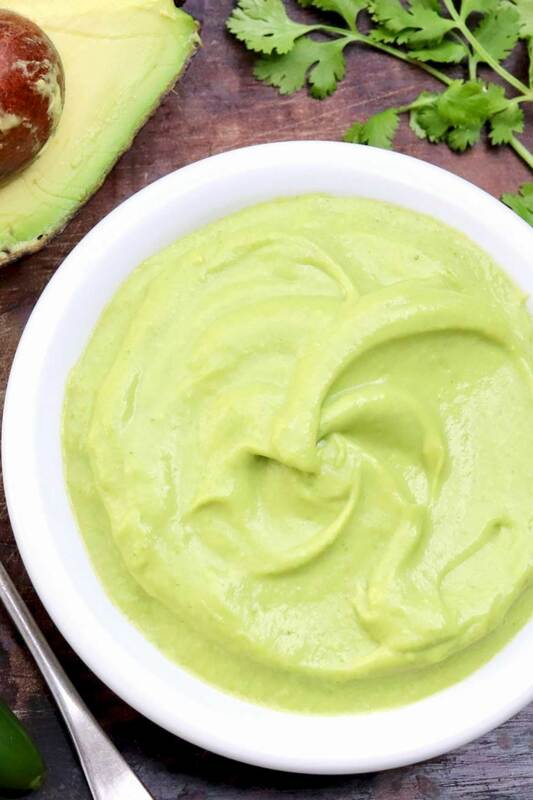 Without a doubt, Super Creamy Avocado Lime Sauce is Everything Sauce, take two. I first made this versatile sauce months ago for a friend who was struggling through Whole30. She had requested sauces that would provide the flavor and satiety that she was craving after a week on the plan. When I was originally fiddling with the recipe, I had visions of adding a touch of honey to balance the lime. That ingredient isn’t part of the Whole30 plan, so I omitted it–and then when we ultimately dipped our spoons in the blender for a taste, we had no desire to mask the pleasant zing of the lime. Of course, if you prefer a touch of sweetness, you could absolutely add a drizzle of honey to the blender. So how might this easy blender sauce be enjoyed? For starters, think of all the ways you enjoy guacamole–as a dip, on tacos, burgers, fish, chicken, salads, burritos (regular and bowl versions), and so on. Beyond those specifics, anything with a south-of-the-border theme or anything simply prepared that could benefit from the moisture and flavor of a salsa or sauce. Think grilled chicken, broiled salmon, or a baked potato for starters. You could use it in place of mayo, perhaps on a turkey sandwich or stirred into egg, tuna, or chicken salad. My younger son could scoop up a whole batch with the help of a bowl of tortilla chips, but veggie dippers work well, too. My favorite way to enjoy is to start with a base of cooked rice or quinoa, and then add any combination of chicken (or shrimp, steak, or pork–and leftovers are fair game), black beans, tomatoes, maybe a little corn and some chopped romaine, a crumble of tortilla chips, sometimes some shredded cheese–and top it all with the avocado lime sauce. Such an easy meal. And YUM! Or make a simplified version of the above using a baked potato (regular or sweet) as a base, and then add black beans for protein, a scoop of chunky salsa, and avocado lime sauce. Such an easy and healthy meal! Move over guacamole, if only briefly. This versatile sauce has the power to transform even the simplest of meals. Plus it's dairy-free and vegan and will maintain it's beautiful green color for days! Add all of the ingredients to a blender and blend until smooth and creamy, scraping down the sides once or twice as needed. Add a little more water if you’d like a thinner sauce, adjusting seasonings according to taste, if needed, to offset the additional liquid. If your blender has a wide bottom, green flecks of cilantro will likely be visible (which is fine and doesn’t alter taste) and the blender may not blend to a super creamy texture. This happens when there isn’t enough mass to evenly whirl in the blending mechanism. In this case, you’ll need to scrape down the sides a few more times—or can be remedied by making 1.5 or 2X the stated recipe. Depending on how you use this sauce, you may enjoy a subtle hint of sweetness. If so, add a teaspoon or so of honey, adjusting to taste. Super Creamy Avocado Lime Sauce nicely dresses all sorts of veggie, grain, and burrito bowls. The simple blender sauce complements the likes of black beans, sweet potatoes, rice, quinoa, corn, tomatoes, bell peppers, chicken, pork, seafood, and steak. 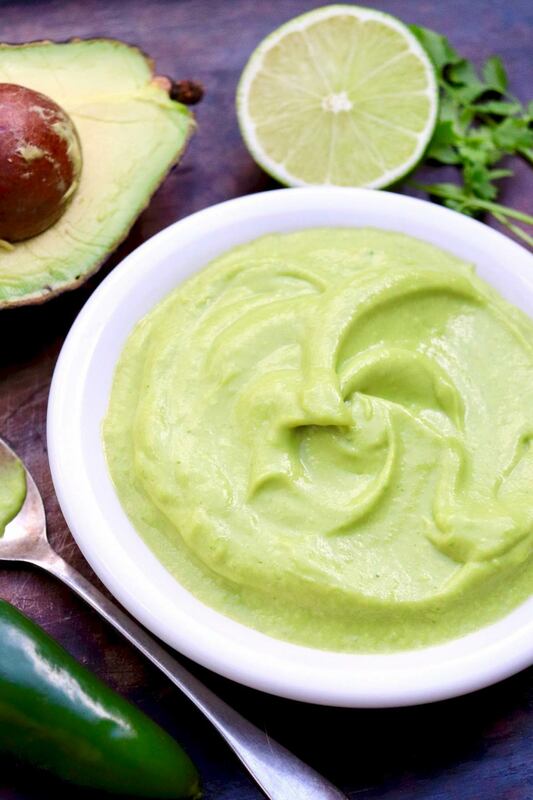 It’s likely to complement anything Tex-Mex—just think of all the ways you might use guacamole, and give this flavorful sauce a go instead! This would be great over the international dish I make with quinoa. Have been wanting to make it and this gives me a new idea! I’ve been slathering this over everything since I made it three days ago. It’s amazing…and still green! So happy you’ve been enjoying this, Richard! I’ve made this twice and have thoroughly enjoyed! Wonderful! Thanks for letting me know, Erin.